Rome Ryott left the School of Navigation as SCC (Boats) in July 1958. He served his cadetship with P&O, during which time he spent some nine months aboard a P&O tanker "Mantua" with two other Warsash cadets. (Centre in the attached photograph). 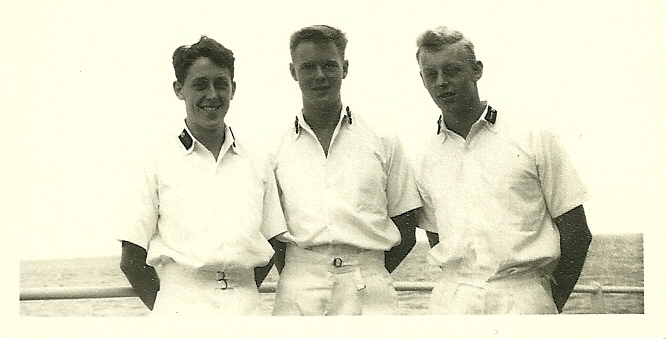 He was a fine athlete, reserved but charming, a good shipmate, and good-looking. Not altogether surprisingly, his father had been a well-known movie star, particularly in silent movies in the period after the First World War, under the stage name of Stewart Rome, from where Rome acquired his unusual first name. In about 1962 he obtained his 2nd Mate's Certificate. After that, it is not clear what he did; but he was next heard of as a pilot in the RAF. It seems likely that his athleticism served him well as a pilot: after completing his initial flying training in 1965, he flew both fixed wing and rotary wing aircraft, to a high standard judging from the competitions which he won, until he retired after completing pensionable service in 1981. On retirement from the RAF, at about the age of 42, he took to cruising under sail in his yacht "Aroha" with his girlfriend. He sailed from the UK in April 1982. On 2nd November of that year, the South African Air Force is recorded by Lloyd's List Casualty Report two days later as having advised: "Wreckage found approximately 40 miles north of Cape Town at Springfontein near Melkbosstrand. Wreckage consisted of white glass-fibre hull part, lifejacket, clothing, blankets, and fuel containers. The number 38986 was on the name board. An air search is commencing tomorrow morning, initially along the coast and then out to about 350 miles NNW of Cape Town along computer-predicted drift of life raft." Unfortunately, the Lloyd's List report added information received on 3rd November, based on a report from Reuters published on the same day in "The Times" as follows: Cape Town (Reuter) - Mr Rome Ryatt (sic), aged 43, a retired Royal Air Force flying instructor from Lymington, and his female companion are missing feared dead after their yacht was wrecked in a storm." Probate of Rome's will was granted in early 1984.